From Facebook’s Macedonian Fake News Factory to Google returning false election results, fake news was a major story of the 2016 election. Anyone who’s ever received a chain email will tell you fake news is nothing new; it’s just spreading faster than ever (maybe even faster than the disease you’ll get if you don’t forward this to 10 coworkers). Regardless of the broader effects of fake news, everyone agrees it’s harder to get to the real stuff when you have to sift through twelve million links to who the Pope endorsed. The sheer amount of Internet content—true or not—is one of the reasons 62 percent of people use social media as a news source, but it’s also part of why more discerning audiences are retreating to the humble email newsletter. While the post-election surge of interest in reputable journalism led to subscription surges at many major publishers, it also leaves readers with an overabundance of news. People want real news but need it fast, and newsletters provide the convenience of Facebook with less noise. Meanwhile, the email newsletters publishers have long relied on to boost engagement and ROI are now being recognized as a means to hold onto these new subscribers. Though derided and routinely declared dead, email remains a favorite of audiences and publishers alike simply by playing to its strengths: delivering easily-digestible content that increases traffic. Sure, email won’t win any awards in the “shiny next-big-thing” category, but as Financial Times journalist Andrew Jack has observed, the same technical limitations that have emailers sharpening their pitchforks have allowed email to innovate in more subtle ways. Jack identifies four characteristics of many major email newsletters that combine to make them a uniquely ideal medium for readers, publishers, and everyone who’s not your conspiracy theorist uncle. Publishers can use email to bring a selection of articles to the surface, making discovery simple. When the Washington Post alone produces 500 stories each day, it’s a struggle just to find relevant articles, and those pesky social media algorithms don’t make discovery any easier over there. Subscribing to any of the Post’s 50-plus newsletters provides immediate access to top articles, skimmable segments, or the latest content about a particular subject. It’s the fastest way for an audience to discover the content they want, and it’s not a bad deal for publishers either: pushing newsletters helped the Post increase their digital subscriptions 149 percent YoY. Newsletters are curated, allowing the incorporation of context and/or a broader narrative. Facebook has backtracked on human curation, preferring to make their trending topics section an automated mess rather than seem biased. Meanwhile, the email newsletter has been more than happy to play “arbiter of truth,” and readers are more than happy to listen. They’re the ones who signed up for the letter, after all. Curation adds the human element absent in mere content aggregation by filling in knowledge gaps with context, forming a meta-narrative with related articles, or just providing a little extra analysis. That way, the reader sees the complete picture, the publisher sees a little more engagement, and nobody has to see the obscene video Facebook’s AI thought was so important. Email can introduce readers to new content they wouldn’t normally seek out. While social media’s hyper-personalization tends to shield people from different views, newsletters provide a peephole to the outside world by occasionally showcasing content that doesn’t quite align with the reader’s interests. The enclosed nature of email makes it more likely the rogue article grabs the reader’s attention, encouraging discovery of something new. This serendipitous effect is great for an inquiring mind, but it can also be a boon for publishers, who benefit from the increased engagement. 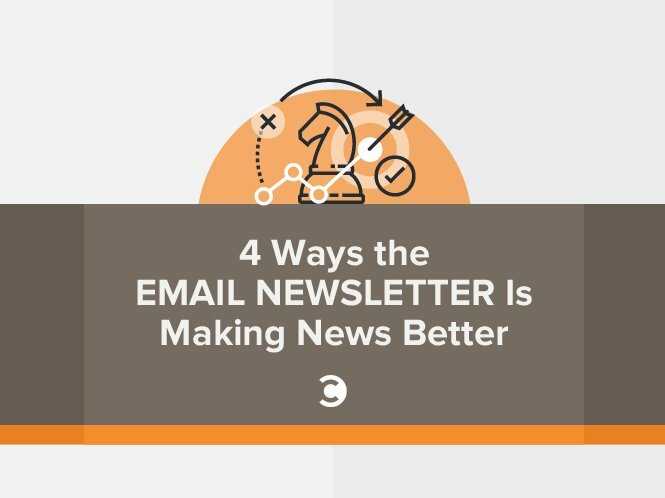 Publishers often incorporate pieces from their other newsletters, in hopes the reader might find a new favorite email. The newsletter’s contained space provides “finishability.” People like to complete things. It’s why crossing items off your to-do list feels so good, and why writing additional items just to immediately cross them off is no big deal, leave me alone. Mail newsletters are finite, unlike news sites or your uncle’s rants on international trade, and having a clear end in sight makes them a satisfying read. Whereas endless walls of text and links intimidate less focused audiences, the newsletter’s easily-digestible bits motivate them to finish reading. The sense of completion newsletters provide also increases the likelihood that readers will return to engage with the next one, which is pretty satisfying for publishers too. Readers are looking for alternatives to social media for their news, and the idiosyncrasies of the email newsletter make it attractive to readers of all interests. It’s a consistent source of curated content that’s easily digestible, easily completed, and easily forwarded to your uncle who keeps getting duped by mischievous Onion wannabes (scallions?). Email newsletters are great for publishers too, and never more so than they are now. Search engines and social media sites are finding that solving the fake news problem may be harder than they thought. In the meantime, the renewed interest in paid journalism means people are twice as likely to purchase a subscription if they already receive a newsletter, which makes this the perfect time for publishers to double-down on their email efforts. With everything they have going for them, it’s not hard to see why email newsletters have earned high praise from readers, publishers, and even the Pope himself. Keith has over a decade of experience driving product-led growth at companies large and small. Before joining PostUp, Keith served as VP of Revenue at SpareFoot.com, the leading consumer marketplace for the $22Bn self-storage industry. Prior to SpareFoot, Keith led product at the financial services company NetSpend.